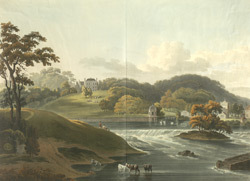 View of Leixlip, eight miles from Dublin, in County Kildare, Ireland. Leixlip was an important Viking settlement from the eigth century whichwas the western boundary of the Scandinavian kingdom of Dublin. The name is thought to have derived from the Dutch word ‘Lax- hlaup’, meaning salmon leap. The river cascades down a limestone ledge to form a stunning waterfall, creating a natural course for salmon. This is a view of Leixlip , taken from a bridge over the River Liffey at the point where the Rivers Liffey and Rye Water meet. To the left in the hill can be seen Leixleip Castle and to the right part of the town and the church.